The Stance Form This form contains all the basic stances performed in a series and is used to, not only as a stretching and strengthening routine, but also develops coordination between the upper and lower body. It should be practiced slowly and smoothly. Many of the twisting movements are designed to help stimulate the internal organs. We consider this to be the most important form in Esoma. Blocking Set The basic blocks, strikes, and stances are taught through the repetitious use of these drills and combination. Attacking Set This form contains all the basic blocks and strikes performed in a series. Kicking Set These are the first Six kicks performed in a series. Techniques For Yellow Sash Yellow sash techniques, with their exaggerated moves, work on distance and timing. Orange sash techniques work to refine distance, refine timing and concentrate on accuracy. Sparring (Level One) Level one is practiced by the beginner after learning the basic blocks, kicks, stances, and passing the test for yellow sash. The objective is for the aggressor to maintain a steady rhythm while attacking; and for the defender to match the aggressor's tempo. At no time should either attempt to trick the other by sudden moves, or include strikes for the purpose of scoring. By sparring slowly and matching each other's moves, the student quickly learns to block strikes and kicks from all directions while remaining relaxed and fluid. More advanced students use this as a practice tool for very fast, aggressive sparring. Sparring (Level One) Level two, beginning around Green Sash, incorporates strategy and miss-matching tempo. The objective is to match tempo in defense, and miss-match tempo in offense. Since the aggressor is attacking with a broken rhythm, the challenge for the defender is to match the broken rhythm. Two Opponents (Level One) Level three, practiced above Green Sash, is designed to develop strong fighting skills by requiring the student to commit mind and body to attack with the confidence of a warrior whose intent is to totally overcome the opponent. Each blow should be delivered with enough speed, power and focus to finish the fight. Sparring - Two Opponents (Level Two) Level four sparring is practiced by the most advanced practitioner. This level is called "Slippery Hands". When a hand attack is blocked by the defender, the attacker swiftly bounces off the block, absorbing the force of the block and using it to redirect the attack in an arc back to the defender with greater speed than is possible without the aid of the block. 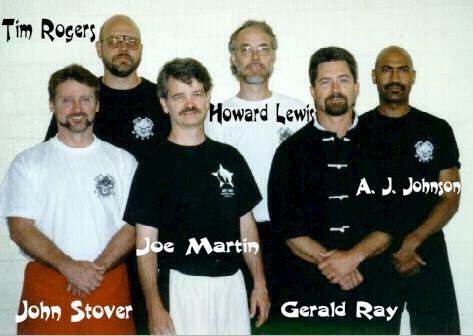 The total experience of these instructors = 137 years! With the instructors not show, it's over 210 years!